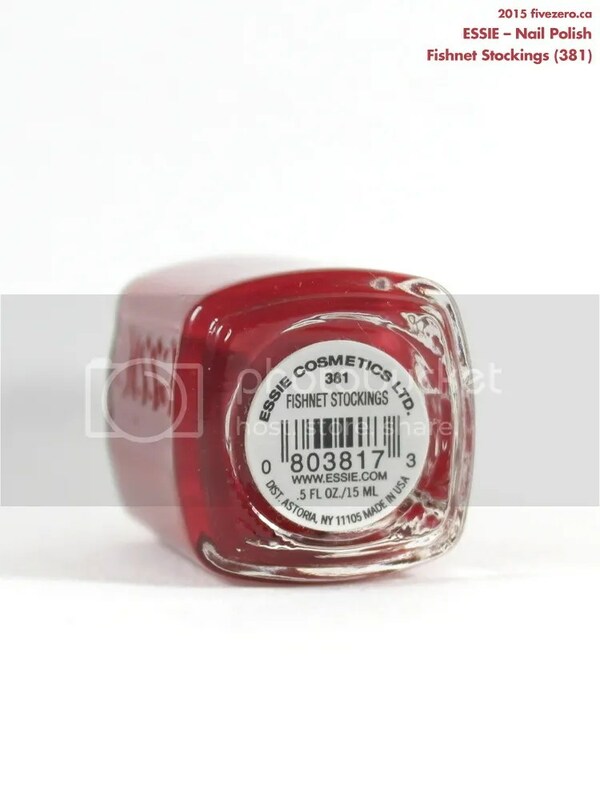 Essie describes Fishnet Stockings (381) as a “spicy dark creme red”, which is interesting because it’s near-twin, recently-released Shall We Chalet?, is described as a “seductive ruby”. I did a comparison in Tuesday’s review of that polish, so you can check that out to see how the two polishes compare. Fishnet Stockings was likely introduced around 1999, based on its 381 code, and it is still available in Essie’s core collection. It’s difficult to see why Shall We Chalet? was just released in the Winter 2015 collection when it is so very similar to this classic shade in Essie’s own lineup. I’d describe Fishnet Stockings as a neutral, midtoned red cream. There’s a jewel-like clarity to the color that is quite striking, and while I don’t usually like neutral reds as much as warm-toned and cool-toned reds, this is probably one of my favorites in its color group. My bottle is fairly old, but it still applies very nicely. Two coats gives you even, opaque coverage. There’s a very slight jelliness to the formula, though Shall We Chalet? is the jellier of the two. If neutral reds are your thing, this is one of the best ones. Essie Nail Polish retails for US$8.50 / CA$9.99–$10.99 and is 0.46 US fl oz / 13.5 mL. The polish is free of toluene, formaldehyde, and dibutyl phthalate (DBP). (I bought my polish on clearance several years ago, and I do not know whether it is 3-Free.) It is made in the USA. Essie Cosmetics, founded in 1981, is based in Westfield NJ, USA. In 2010, Essie was acquired by the L’Oréal Group. So would you say Fishnet Stockings > Shall We Chalet? I think I need one of them in my stash. I think I used to have Fishnet Stockings in a mini but I got rid of it because I hate minis! If the current formula of Fishnet Stockings is the same as mine, I’d say definitely. FS just just has a clearer, more vibrant color. (I mean, it’s hard to tell indoors, but in sunlight, you should be able to tell.) Both apply well, so no issues there. Ah, the chip is no biggie whatsoever. What a super pretty shade, though! I love reds, especially warms and neutrals. =) So glad the formula works well. 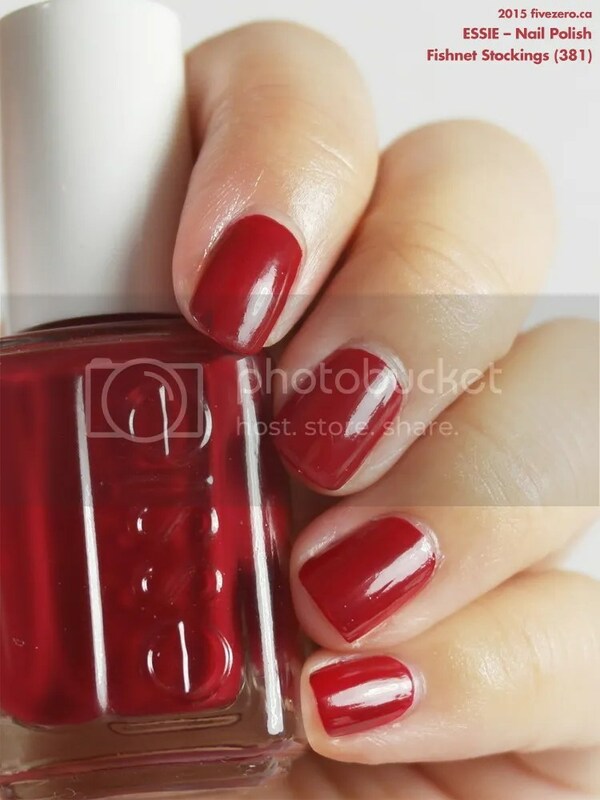 I love red nails as it is more classy and more of a Hollywood style albeit. 413,081 times by nail polish fans!